t's the first day of April and we're still covered in snow... Mother Nature's idea of an April Fool's prank I assume. 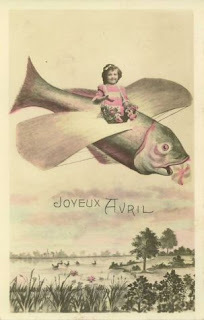 I was curious as to why so many vintage April Fool's Day cards and postcards were simply people holding a fish, or better yet, just a fish. So, I did some digging. In France, the victim of an April Fool's prank was called Poisson d'Avril, or April's Fish. Still not sure why there is a peppermint in the flying fishies mouth, any ideas? Besides masking a fishy smell, though maybe that's the "reason". I hope you all have a lovely day and don't fall victim to too many pranks. Oh, and don't forget to enter the giveaway, that's not a joke! Fascinating! The whole fish-connection - I had no idea! 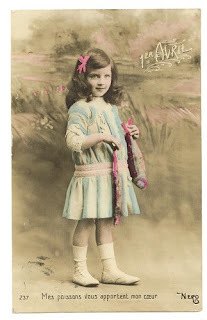 Very sweet vintage cards.